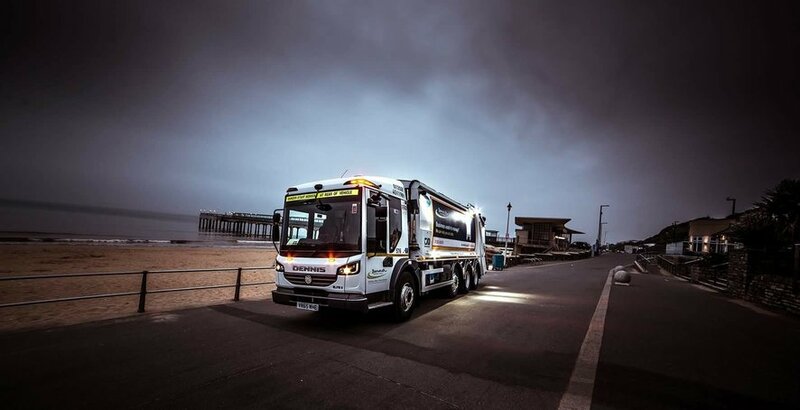 Bournemouth Council has invested in a brand new 32 tonne refuse vehicle equipped with the latest safety technology, which will perform the same rounds as previously carried out by two vehicles. The 32 tonne Olympus 27 Refuse Collection Vehicle from Dennis Eagle is equipped with a Terberg OmniTRADE bin lift as well as safety equipment from Innovative Safety Systems (ISS). The new vehicle will form part of Bournemouth Council’s refuse collection fleet, which consists almost entirely of Dennis Eagle products. In line with the rest of the Authority’s waste and recycling fleet, this vehicle has been fitted with the Cyclear™ cyclist safety system, RX4 four-way Hard Disk Recording Camera System, Reversing Radars and LED Lightboard, all from ISS. The vehicle will initially carry out combined trade and litter collections including the beach. It also assisted in cleaning up the local area during Bournemouth’s award winning Air Festival, which took place in August 2016.